On 20 April, I went to observe macaws near Cerro Hoya NP with Juan Velazques. 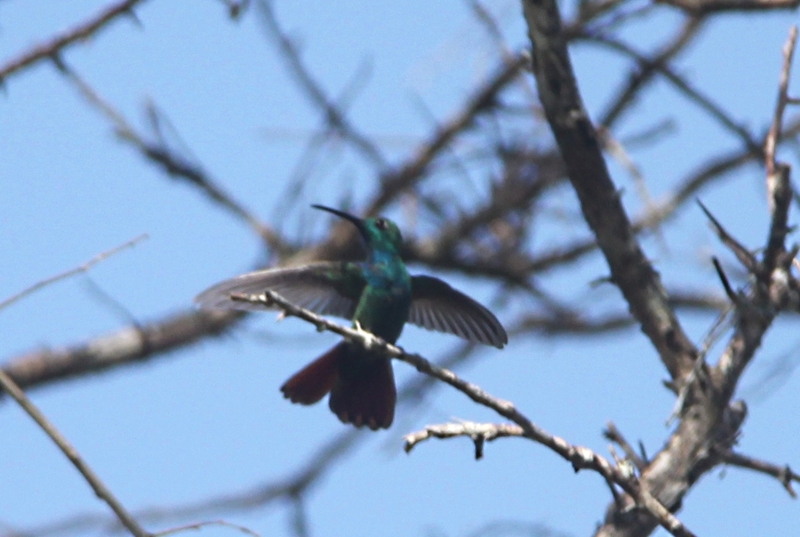 From our observation point (N7.35011, W 80.78059; decimal degrees, WGS84) we saw not only at least 15 Great Green Macaws, but also several hummingbirds. Our observation point was about 100 m above sea level, so to have Violet Sabrewings visiting flowers there was already somewhat unusual. Even more intereseting, though, was the presence of a Veraguan Mango. On the photo, you can clearly see the maroon rounded tail, all black downcurved bill and the dark blue stripe on the throat.